What have the Daughters of Charity learned from their experiences in Ethiopia? That everyone there — rich and poor, educated and illiterate, elderly and infant — is directly or indirectly affected by AIDS. No one gets by unscathed. As a result, most of the Daughters’ projects in Ethiopia, in social work, education or health, include an AIDS element. The enormity of the AIDS epidemic in Ethiopia is staggering. According to the most recent United Nations estimates, three million of the 64 million people in Ethiopia are infected with the AIDS virus. One million children are orphaned. Fifty to 70 percent of prostitutes, many in militarized zones, test positive for H.I.V., the virus that causes AIDS. The disease is spreading at such an alarming rate that by 2010, seven million to 10 million Ethiopians will be infected. More than 1.7 million, or 15 to 25 percent of Ethiopia’s children, will be orphaned. Sister Aster Zewdie, the Provincial for Ethiopia’s Daughters of Charity, said she and the rest of her community of 67 sisters did not enter religious life to sit at a desk crunching numbers. They joined the Daughters to get their hands dirty. In a spirit of humility, simplicity and charity, the Daughters of Charity have stepped into action to serve those in most need, following the example of their 17th-century founder, the French priest St. Vincent de Paul. “It is our charism that we serve the poor through Christ and we serve Christ through the poor,” Sister Aster said. “St. Vincent didn’t want Christians to stay away from the poor by praying. With this in mind, the sisters say their morning prayers and head out to work. Yet they are also the first to admit that the work of the Daughters of Charity in Ethiopia, a country roughly twice the size of Texas, does little to even register a blip on the fight-against-AIDS radar screen. Read more about how the Daughters of Charity responded to the AIDS crisis in the March 2003 issue of the magazine. Even before meeting Volodymyr, Halia imagined herself as a priest’s wife. She grew up in Yavoriv, a center of the underground church. She had a regular underground confessor; underground nuns taught her catechism. …The life of a small-town priest is busy. Father Havrylenko gets up at 6 a.m. and celebrates the Divine Liturgy in Yavoriv at 8 a.m. He then hears confessions, which takes much of his time throughout the year, especially before Easter. Three days a week he teaches a course on Christian ethics at a local public school and a few times a week he leads evening devotions. He also teaches special catechism classes throughout the year. Three priests serve St. George’s, so every third week Father Havrylenko takes his turn “on duty.” In addition to other tasks, he conducts funerals, makes sick calls and presides at baptisms and weddings. Sundays are particularly full for Father Havrylenko. He celebrates one liturgy each in Yavoriv and Koty before driving to Nemyriv to lead the liturgy at Father Stetskyi’s parish. Sometimes he has an afternoon baptism, followed by evening prayer, often conducted in two parishes. “I get home and have breakfast at 7:30 p.m.,” he laughs. Read more about Serving Church and Family from the magazine’s January 2004 issue. CNEWA’s president, Msgr. John Kozar, visited Rome earlier this month, and a few high-profile media outlets covered some presentations involving our work. I’ve been out for much of the day at a variety of meetings, including one late afternoon gathering for a small group of journalists at the Rome offices of CNEWA — the Catholic Near East Welfare Association. It was a fascinating roundtable presentation and discussion with New York-based Msgr. John Kozar, CNEWA president, and CNEWA’s three Middle East regional directors. Joining Msgr. Kozar were Ra’ed Bahou from Amman, Jordan; Issam Bishara from Beirut; and Sami El-Yousef from Jerusalem. Also in attendance were Archbishop Terence Prendergast of Ottawa, Canada, who heads CNEWA in that country, and Carl Hétu, who spearheads CNEWA’s work in Canada. You’ll be hearing more about CNEWA’s amazing work in future columns and interviews for Vatican Insider. Cardinal Timothy Dolan of New York is Chair of the Board of CNEWA. Wednesday, Msgr. Kozar addressed over 100 prominent Italians about the needs of Eastern Christians, especially those of the Middle East, at the headquarters of the Equestrian Order of the Holy Sepulchre in Rome. He spoke in the presence of the Order’s Grand Master, Cardinal Edwin O’Brien and co-host, Cardinal Leonardo Sandri, prefect of the Congregation of the Eastern Churches. He then said, “almost every day, in an area of the world called the Middle East, people face forces far greater than the destruction of a hurricane: they face the storms of conflict, hostility, hatred, poverty, injustice and religious and political persecution. At times, there is little hope of survival, let alone the opportunity to rebuild and to live in peace with hope. “The Catholic Church in this part of the world,” said the CNEWA president, “especially its family of Eastern churches, is small in number, but deeply rooted in the history, culture and fabric of society in the Middle East. It is the presence of the church that offers the poor, the oppressed and the victims of the daily storms of life a sign of hope, where otherwise there would be only flight, fear and despair. Visit EWTN’s website for more. 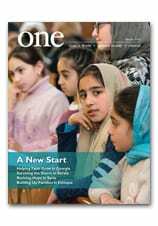 Read more about Challenges For A Land of Immigrants in the November 2008 issue of ONE. In 2011, before he was named a cardinal, the patriarch paid us a visit here in New York. The visit attracted lots of media attention at the time. More recently, the cardinal played a critical role in Pope Benedict’s historic trip to Lebanon. The cardinal joins a long and storied list of contributors to this particular devotion. Last year, for the first time, a married couple, Danilo and Anna Maria Zanzucchi, composed the meditations. In 2005, the meditations and prayers were written by then-Cardinal Joseph Ratzinger. Father Douglas May grew up in a small town near Buffalo, New York, but now serves as a Maryknoll missionary in Cairo. When an American, Latin rite Catholic priest finds himself living and working with Eastern Catholics among Muslims and Orthodox Christians, he is bombarded with emotions from awe and puzzlement to déjà vu and arrogance. As a seminarian at Maryknoll 33 years ago, I found dogma, church history and liturgy boring as academic subjects. Since my first direct encounter with the Coptic and several other Eastern Catholic churches in Egypt 30 years ago, what I found boring on paper has been anything but boring in real life. As an “outsider,” there is so much richness to experience, history to fathom, wisdom to ponder, controversy to understand and a global church vision to offer. The Coptic Church traces its history to ancient Alexandria and St. Mark the Evangelist. Egypt is the land of many prophets and church fathers. The monastic movement was founded in Egypt by two great monks, Anthony and Pachomius. Theologies and heresies battled here, causing schisms in the church that exist in some form even to this day. One of the first schisms in Christian history regarded the essence of Jesus: Was he “true God and true Man?” The bishops of Rome and Alexandria parted ways after an ecumenical council in 451 offered a solution; which the church of Egypt largely resisted. What little remained of the Catholic Church in Egypt after that time was Greek-speaking and of the Byzantine tradition. And this disappeared after the Great Schism of 1054. Near the end of the 18th century, the Catholic Church tried to reestablish itself, but little happened until a group of Orthodox Copts entered the Catholic Church and formed a Coptic Catholic rite, which was later recognized by the Egyptian government in 1900. The first Coptic Catholic seminary was opened in that same year. Since the seventh century, Islam in Egypt has grown — slowly — at the expense of the church. Egyptian churches struggled to preserve their identities while being tempted to “ghettoize” themselves. Working with Eastern and Latin Catholics in Egypt, combined with having Muslim friends, has put me in a unique position. First, I felt like a “space invader” intruding into the many subcultures of Egypt as an unwelcome outsider. Now, I feel more like a “bee” buzzing from one subculture to the next, picking up “pollen” from one and leaving a little bit of it on another as well as on myself. I find myself challenging some of what I encounter and being challenged by much more. In many ways, the reforms of Vatican II have just started to work their way into the Eastern churches. Vatican II was originally perceived as a Latin rite council that had little to say to the Eastern churches. Only in the last decade or two have the Eastern churches really had to deal with the social and ecclesial issues that the Western church has had to deal with for the last five decades. John Paul’s visit gave Egyptian Catholics a sense of global identity they had never experienced. The Eastern Catholic churches of Egypt are beginning to emerge from these shadows. They are ready to offer their contributions to the world. A former Syriac Catholic bishop of Cairo and professor at the Coptic Catholic Seminary was, until recently, the cardinal prefect of the Congregation for the Eastern Churches in Rome. As a former patriarch, Cardinal Ignace Moussa Daoud’s outreach to his Orthodox counterpart was cited by some observer’s for his selection to the post by Pope John Paul II in 2001. They would often refer to themselves as “brother patriarchs” and “co-patriarchs,” which is seldom heard in Eastern church circles. The former Armenian Catholic bishop in Cairo has been the Armenian Catholic patriarch for well over a decade, and he is following the lead of his Syriac Catholic colleague. The former Coptic Catholic Patriarch Cardinal Antonius Naguib (who resigned earlier this year for reasons of health), has encouraged the renewal of the Coptic tradition, maintaining for example the Eastern Christian tradition of a married and a celibate clergy; in the Eastern churches, celibacy is seen as part of a “monastic call” that does not always aid a diocesan priest in living a pastoral life of service. Seminarians studying at St. Leo the Great Coptic Catholic Seminary. My challenge in Egypt, since the January Revolution began last year, is to encourage seminarians, priests and bishops to step out into the perilous world of social justice concerns. In Egypt, there are long-held traditions of religious and sexual discrimination in society along with denying the laity an active role in church affairs. Acknowledging first the faults of my own country and church, I urge local church leaders to speak out and act on these issues. For example, 13 years ago I helped Bishop Ibrahim Sedrak, the former rector of the seminary, attend the Vatican II Institute renewal program in Menlo Park, California. It was a rewarding experience, and one I hope will help him in his new role as patriarch of the Coptic Catholic Church. During my ten years at the Coptic Catholic seminary, I would introduce social justice issues into all of my teaching and get the seminarians to view Egyptian issues in a more global and ecumenical context. I often exposed “blind spots” of injustice that may have been only visible to me as an “outsider,” and they often confronted me with my own personal, national and ecclesial blind spots. I tried to bring Muslim, foreign and female friends to the seminary so that the seminarians could view my interactions. In my homilies at both the seminary and expatriate parishes where I still help out, I habitually insert justice and peace issues that seem to relate to the readings. Over the years, I have drawn pictures of an Egyptian church building having all its doors and windows bricked up for fear of the outside world. Now, the Coptic and Eastern Catholic churches of the Egypt need to knock down these protective barriers and be new witnesses to what they can offer at home and be bold witnesses in what they can offer to the world. It is an exciting adventure to be part of the process of a church risking its security and taking its place in the global Catholic community. Egypt’s Eastern Catholic churches are very much part of the mosaic that forms the Catholic Church. Ukrainian Bishop Peter Stasiuk celebrates the Divine Liturgy on Epiphany in Melbourne, Australia. Once Europeans gained a foothold on the continent, the native population, estimated at about 350,000 at the time of settlement, began its precipitous decline, due mainly to infectious diseases. Open land, a gold rush and the building of railroads generated an immigration boom — not limited to Europeans — in the mid-19th century. But reactionary, anti-Asian discriminatory practices soon generated laws restricting the settlement of Australia to northern Europeans alone. This “White Australia Policy,” enacted nationally in 1901, controlled immigration for more than four decades, until reforms in the second half of the 20th century all but eliminated its effectiveness. Read more about Diversity Down Under in the May 2007 issue of ONE.